The magistrates' court is the central part of our system of justice and wherever you live in England and Wales, the chances are there is a magistrates' court nearby. It is there to serve the local community. For over 600 years Justices of the Peace (or magistrates as they are usually called) have held courts to resolves local disputes and restrain local law breakers. Now, most courts meet daily and are administered by Her Majesty’s Court Service (HMCS) to provide a high quality, cost effective service to local communities. Magistrates are members of the local community appointed by the Lord Chancellor to sit in magistrates' courts and decide on cases brought before them. Magistrates are appointed from the age of 18 and all magistrates retire at the age of 70. Of the 30,000 lay magistrates in England and Wales today, almost half are women. What qualifications do you need to become a magistrate? No formal or legal qualifications are required but magistrates need intelligence, common sense, integrity and the capacity to act fairly. Each applicant is carefully assessed for judicial potential as it is essential that a magistrate can identify relevant issues and deal with them even-handedly; establish an independent position and discuss it without either dominating the discussion or giving way to others. How do you become a magistrate? Applicants are asked to complete an application form which can be obtained from www.direct.gov.uk/magistrates or the local Advisory Committee contact. There are usually two interviews and the Advisory Committee appointed by the Lord Chancellor are responsible for making sure that magistrates are drawn from many walks of life and are representative of their local community. About 1,600 new magistrates are appointed each year to one of 58 Commission Areas (either a shire county or a former metropolitan county - there are five in London and in the City). Each magistrate is assigned to serve in a petty sessions area within the commission area. The number of magistrates in each petty session area (called a bench) varies from about a dozen to five hundred. Do lay magistrates receive any training? All magistrates are carefully trained before sitting and continue to receive training throughout their service. Training courses take place during the first two years following appointment and cover such topics as basic rules of court procedure, current legislation, sentencing powers and options, decision making and communication skills. Mentoring, on-the-job training, observations in court and visits to other institutions also form part of the training programme. As magistrates become more experienced they continue to undertake training to ensure they remain competent. They also receive specialist training in preparation for taking the chair in court, or for work in the family or youth court. Justices are unpaid volunteers but they may receive certain allowances to cover travelling expenses and subsistence. A small allowance contributes to any financial loss which they may have incurred as a result of performing their duties. How often do magistrates sit in court? The Lord Chancellor requires a commitment from a magistrate that he/she can sit sufficiently frequently to keep in touch (an average of 35 and a minimum of 26 half day sittings per year. Sometimes more if a magistrate is a member of Family or Youth Panel). What kind of criminal offences do magistrates deal with? How much crime is dealt with in magistrates' courts? All criminal cases start in the magistrates' court and over 95% of cases are completed there. Last year over 1,500,000 cases were dealt with by magistrates' courts. Do magistrates deal with any other matters? Most magistrates' courts have special courts, like the Family Court, which deals with issues such as family disputes, adoption and care orders of children. Magistrates also deal with witnessing documents, public entertainment licence appeals, signing search warrants etc. How do magistrates decide which sentence to give? The defendant's explanation of the offence and any other relevant matters in the defendant's favour. What sentencing powers are available to magistrates? The maximum penalty available to magistrates is six months imprisonment. Other available sentences include community penalties, compensation and fines of up to £5,000 for each offence. Magistrates can commit certain cases to a higher court for a heavier penalty. Who is responsible for running the courts service? Her Majesty’s Court Service is the responsibility of the Ministry of Justice. Locally it is managed by a Court Manager who aims to provide a fair, efficient and cost effective service for local people. What other personnel are in the Magistrates Court? The Court Clerk Legal Adviser - ensure that the magistrates have all the information they need to do their job. He/she identifies the defendant, reads the charges and at the end of the trial summarises the relevant law for the magistrates. The Usher- makes sure that order is maintained in the court and that the proceedings run smoothly. The Court Reporter- may work for local or national press, usually newspapers but also for radio and television stations. They attend court and report on the cases. The Solicitor- a member of the public may approach him/her for advice and assistance in matters referred to the courts. Often solicitors will be able to handle cases in front of the Magistrate. The Barrister- a solicitor may refer a case to a barrister if the matter is too serious for the solicitor to handle, a barrister will handle the case. Barristers, unlike solicitors, may represent clients in any of the countries' courts. 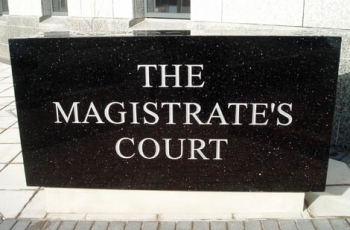 Probation Staff – advise magistrates about offenders when magistrates are deciding a sentence. This information was received from the Magistrates Association, for a link to their websiteclick here .